Stunting and tumbling during cheerleading is the best. Such an adrenaline rush. BUT think about trying do all of that while you are sliding around in your cheer shoes. It can cause rolled ankles, your bases can't hold on to your foot well enough, your tumbling won't be as flawless. That is why we are here today. To teach you how to tie your cheer shoes. We know what you're thinking, tying shoes? What are we 3 years old all over again? It's a pretty easy thing to do but we can't tell you how many rolled ankles we've seen because they are not lacing up their shoes properly. 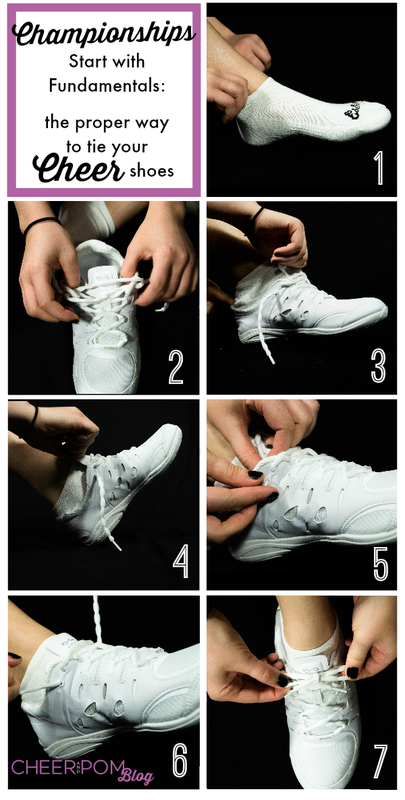 So here is our tutorial on the best way to tie your cheer shoes. Also make sure you check out the video where Erica shows you exactly how it's done! 1. Pull up your socks. Make sure that your socks are on straight and there are no bunches. Bunched and loose fitting socks can cause rubbing and your foot to slide around. Loosening the laces of your shoes before you put them on will make it easier for your foot to fit in the shoe and will allow better foot placement within the shoe. Pretty self explanatory, we know. But just make sure you're holding on to the tongue of the shoe so that it doesn't slide down in the process. 4. Heel all the way back. Once your shoe is on, make sure your heel is sitting all the way in the back of the shoe. We like to tap our heel on the ground just to make sure our foot is all the way back. 5. Lace them up all the way. Now lace up your cheerleading shoes! Start from the bottom and tighten as your go up. Always lace them all the way up to the very last eyelet. This will help to hold your ankle in the shoe and prevent rolled ankles or any other foot injuries. You want to make sure that your foot is secure. Once you're all laced up, tie them snug. If you're more comfortable with double knotting them, go for it. Otherwise once will be perfect. Just make sure that you are able to untie them when your done with cheer practice or your game. When you're ready to take off your shoes, make sure you untie them!! We know, slipping them off is so much easier! But it will stretch out the shoe and your foot won't be as secure while tumbling, stunting, and cheering. So there you have it. Super easy and will only take an extra 30 seconds for you to do. We promise, the extra 30 seconds is worth it! And cheer coaches, we beg of you, if you see your squad putting on and taking off their shoes incorrectly, correct them! Putting on and tying your shoes properly is the first step in cheerleading. What do you think? Have you had a cheerleading shoe nightmare that happened to you or someone else you know? Tell us about it, we'd love to hear it! Wow, I never thought of as cheerleading as serious business - I guess I was wrong! I love to watch their stunts and tosses but you are right. A routine can go wrong if one cheerleader has untied shoelaces!